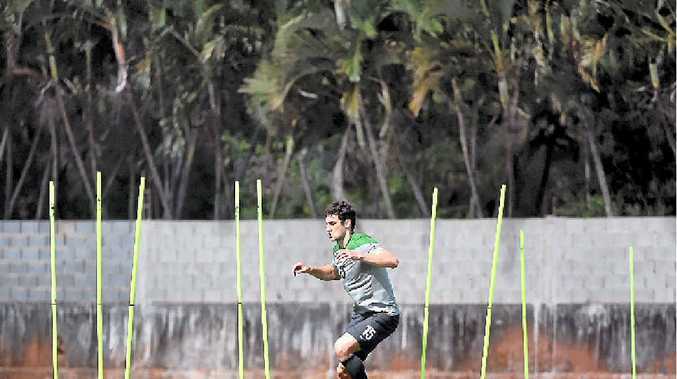 THE Socceroos will play a match against Brazilian second division side Parana Clube at their training base in Curitiba tomorrow morning as coach Ange Postecoglou continues his team's exhaustive training regime for the coming World Cup. Postecoglou blamed the heavy training program for the lacklustre showing in the 1-1 draw with a second-string South African side in Sydney last week. The Socceroos were the first foreign team to arrive in Brazil in an attempt to fully acclimatise to the warm conditions, and will play their final warm-up match against Croatia on Saturday. Postecoglou is expected to name the final 23-man squad on Wednesday. Defender Ivan Franjic (knee), playmaker Tom Rogic (groin) and striker Josh Kennedy (back) have been rested from training, while captain Mile Jedinak (groin) and Mark Bresciano (back), have been on light programs. Australia's opponents in its pool - Spain, Netherlands and Chile - have also been finalising their preparations. The Netherlands squad is due to arrive in Brazil later this week after a friendly against Wales on Wednesday night. Dutch stars Arjen Robben, Wesley Sneijder and Nigel de Jong played in the 1-0 win over Ghana in another friendly yesterday morning, with Manchester United striker Robin van Persie scoring the only goal.